PHOENIX — Once among the most fearsome road teams in the NBA, the San Antonio Spurs will have a chance to reprise that role in the next few weeks. San Antonio is one game into a stretch in which it will play eight of 10 games away from home, and while things started poorly with a five-point loss in Sacramento on Monday, the next stop in Phoenix on Wednesday could provide a softer landing. The Suns have lost four in a row and 11 of 12 since blowing out Dallas in the season opener, and they have had trouble staying competitive. Oklahoma City scored 24 of the first 29 points in a 118-101 victory Monday. The Spurs won the first of four meetings between the two 120-90 on Halloween, when the Suns (2-11) had 39 points in the first half. San Antonio has won 14 of the last 15 in the series. Not that streaks foretell the future. San Antonio (7-5) had a 14-game series winning streak broken in Sacramento on Monday, when the Kings used a 10-0 run in the final five minutes to pull ahead. 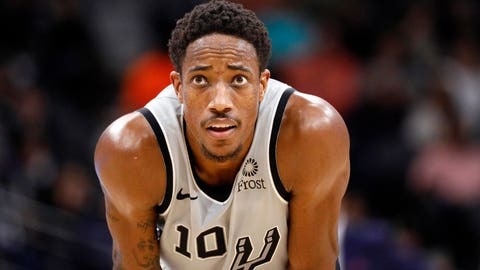 DeMar DeRozan had 23 points and eight assists, LaMarcus Aldridge had 14 points and 18 rebounds and Rudy Gay had 14 points and nine rebounds after missing the previous three games with an injury. “There was just a bunch of miscommunication, switching, and a lot of things that caused us to collapse,” DeRozan told reporters. The Spurs shot 43.7 percent and committed an uncharacteristic 15 turnovers, tied for their second-highest this season. They are averaging 12.3 turnovers a game, the fewest in the league. The Kings also shot 50 percent from the field and made 11-of-24 threes. A natural shooting guard, Bryn Forbes played the point in White’s absence and averaged 12.7 points and 2.4 assists in nine games there. Forbes was especially effective in the first game against the Suns, with a career-high seven assists to go with seven points while leading a precise offense that shot a season-high 55.4 percent. The Suns were often caught a half-step behind. White has scored 25 points in the last two games while getting back into game shape. Spurs coach Gregg Popovich has 513 road victories in his 23-year career, third in league history behind Pat Riley (520) and Don Nelson (517). Popovich has done it in 813 games, the quickest of the group. The Suns have won only two of their seven home games, one since their 121-100 victory over Dallas in the season opener. The Suns’ plus-minus is negative-13.5 points a game, they average 17.8 turnovers and they are shooting 44.6 percent from the field while attempting to integrate a cast of new players including first overall draft pick Deandre Ayton into coach Igor Kokoskov’s ball movement system. New Orleans led by as many as 24 points in the fourth quarter of a 119-99 victory over the Suns on Saturday, the Suns’ first game since they squandered a 14-point lead in the final 3:45 of regulation in an overtime loss to Boston last Thursday. Kokoskov has stressed energy recently, and he was pointed after the loss in Oklahoma City, although the Suns fought back to get within seven points with eight minutes remaining. “The way we opened the game, no presence, no life whatsoever,” he told reporters. “We were behind 20 points in the first quarter. That’s hard. It put us in a situation that we have to compete and play the whole game and every possession has got to be perfect. Suns forward TJ Warren had 21 points against Oklahoma City and has scored at least 20 in the last three games after returning to the starting lineup in place of Ryan Anderson, who has not played the last two and not scored in the last four. Rookie forward Mikal Bridges had 13 points, four rebounds, three assists, two blocked shots and one steal in 26 minutes against the Thunder.